Cheesecake with a layer of caramel over a graham cracker crust wrapped in luscious chocolate. 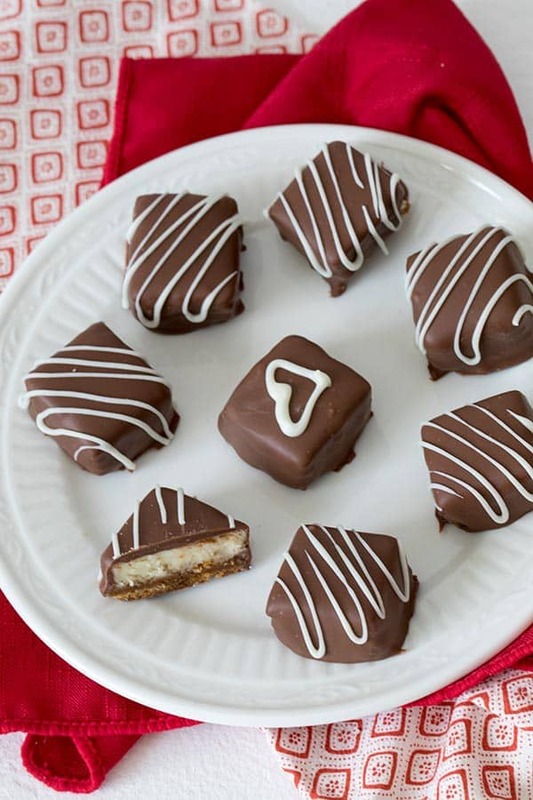 These Chocolate Caramel Cheesecake Bites are a perfect, irresistible Valentine’s treat for your sweetheart. We weren’t able to stop eating these decadent little bites. So creamy, smooth and delicious. I had to get them out of the house just to stop myself from eating them all. I’ve joined a fun group of bloggers to put together a roundup of recipes on the first day of every month! 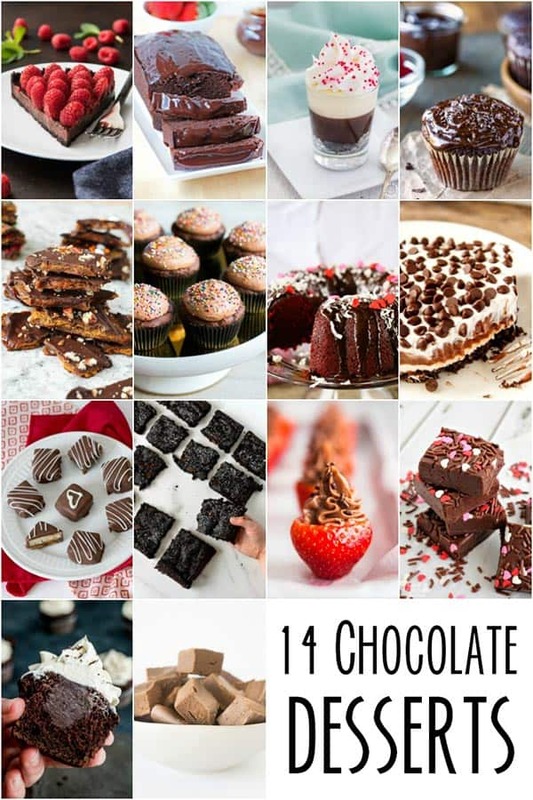 This month we’re doing chocolate desserts just in time for Valentine’s Day. 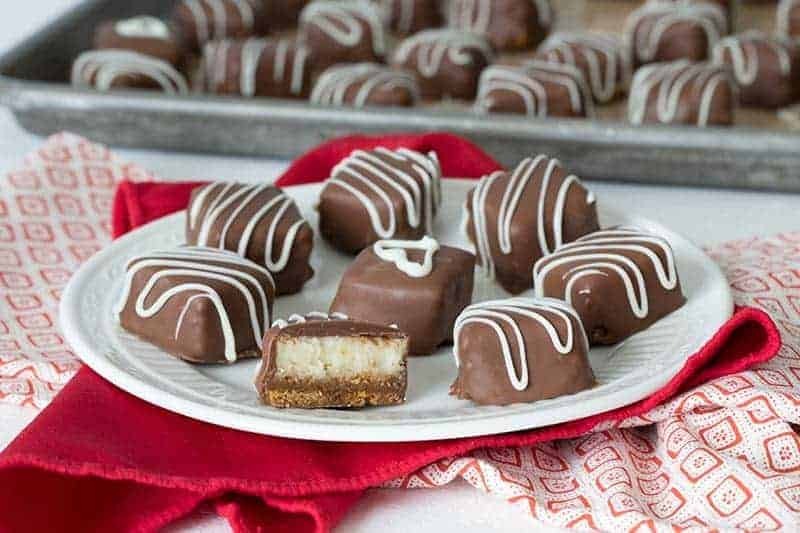 After you’ve checked out this Chocolate Caramel Cheesecake Bites recipe, be sure and scroll to the bottom of the post for links to all the chocolate dessert recipes! For the last three years I’ve made Cheesecake Pops for my neighbor for her birthday. This year I wanted to change them up by adding some graham crackers. I used the watermelon knife I bought this summer to cut the cheesecake. It is extra long and serrated so I didn’t have to drag the knife through the cheesecake. I just cut straight down and pulled it straight back up and then rinsed the knife under hot water before cutting the next section. See that missing piece of cheesecake in the picture? My husband stole that corner when I turned my back to grab the camera. Irresistible! This recipe is a must try. It’s an elegant dessert, that’s easy to make. I was craving these Chocolate Caramel Cheesecake Bites for at least a week after they were gone. Bake for 30 to 40 minutes or until just set 2 inches from edge of pan. Cool on wire rack for 2 hours. Loosely cover; refrigerate at least 4 hours. (I chilled mine overnight.) Lift cheesecake from pan using foil ends. Cut into one inch squares (about 49 squares). 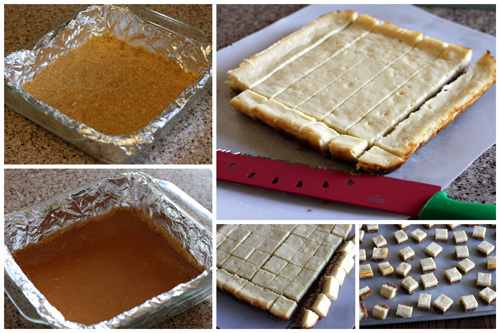 Place squares on a parchment lined baking sheet and freeze for 1 hour before dipping in to chocolate. Oh my, this looks stunning ! Drooling here. I love your gorgeous cheesecake bites and you have decorated them so prettily! This is a recipe to keep! Ohmigerd, I have a weakness for cheesecake. 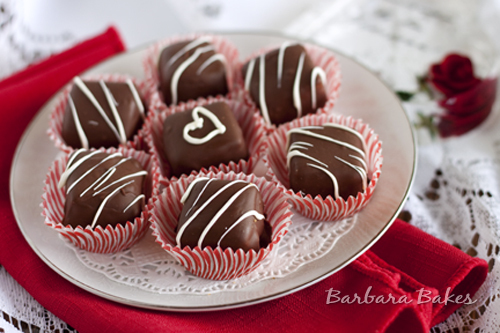 These look sinfully delicious, Barb! Got here from your best of 2012 post, you decorated these beautifully and they look tempting! My food co-op sells caramel chopped but still in one flat sheet (as if you’d made them yourself) instead of individually wrapped. I think that’s what I’d use for a recipe like this– I’m sure they are high quality and it would save the unwrapping. Thanks Mary! I think the sheets would be perfect for this. What a wonderful recipe! Love this one!